Regiment/Catrawd: 23rd Battalion, London Regiment, The Royal Fusiliers. Service Rank and Number / Rheng gwasanaeth a rhif: Private No. SPTS/1688. Military Cemetery/Memorial / Fynwent milwrol: Puchevillers British Cemetery, Picardie. Ref No Grave or Memorial / Rhif cyfeirnod bedd: Plot V1: Row F: Grave 6. Wilfred was severely wounded near Betrancourt at the Battle of Ancre and died on Saturday 18 November 1916 of his wounds, at a casualty clearing station at Puchevillers,France, he was aged 31 years. Wilfred David Powell Jones was born in Llandilofawr, Carmarthenshire, Wales in 1886. The 1901 Census shows that the family at that time lived in Myddfai, Carmarthenshire. The heas of the family was John Jones, Justice of the Peace aged 55, living on his own means. His wife Emma Sarah Jones (nee Steinmetz) aged 58 and their son Wilfred David Powell Jones aged 15 years. Also living with the family and employed by Mr John Jones was, Mary Protheroe aged 26, a Domestic Cook, Lizzie Evans aged 21, a Domestic House Parlour Maid and Margaret Wright aged 22, a Domestic Maid. Wilfred did have a brother, Arthur William Jones, who was born in 1888, but sadly, died as an infant two years later. John Jones died in September 1903, aged 57 in Llandovery, Carmarthenshire. Wilfred was educated at Llandovery College and Hertford College, Oxford. 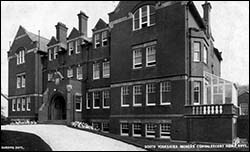 In 1911 he became an Assistant Schoolmaster at Colet House Preparatory School, East Parade, Rhyl, Flintshire. On Thursday 22 April 1915, he enlisted at Hornchurch, Essex and served as a Private in the 23rd Battalion of the Royal Fusiliers. (The 23rd Battalion of the Royal Fusiliers was ‘raised for the upper and middle classes only’, as long as they could shoot and ride). Wilfred was severely wounded near Betrancourt at the Battle of Ancre and on 18 November 1916, died of his wounds at a casualty clearing station at Puchevillers, France. The National Probate Calendar for 1917, administered in London on 30 January 1917 states that Wilfred David Powell Jones of 78 Woodstock Road, Oxford, on his death had left the sum of £3128. 16s. 9d to his mother, Mrs Emma Sarah Jones. On 28 June 1917, a payment of £16. 17s. 8d was made by the War Office to Emma Sarah Jones, being monies owed to her son Wilfred. On 8 October 1919, a further payment which is recorded as a War Gratuity of £6. 10s. 0d was also made to her. Wilfred is also remembered on the War Memorial outside St. Margaret’s Church, Oxford. At Llandovery College, Carmarthensire and Hartford College, Oxford University. His name also appears on a Remembrance Plaque at The Royal Alexandra Hospital, Marine Drive, Rhyl, Flintshire and on the North Wales Heroes Memorial Arch, Deiniol Road, Bangor, North Wales. There is a Flintshire Roll of Honour Card for Wilfred David Powell Jones at the County Archives Office, Hawarden, Flintshire, which is undated and unsigned.